The Nottebohm room is one of the finest reserved secrets of Antwerp. 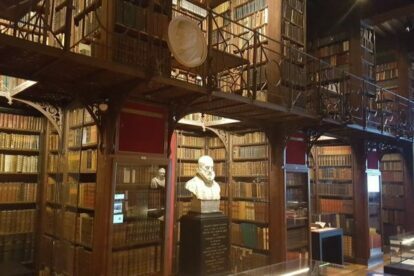 It is located in the oldest part of the Hendrik Conscience Heritage Library, the city library that started in 1481 with 41 books and only opened its doors to the public in 1805! In 1936 this Nottebohm room was built as a ceremonial room and when you go in today it is, beyond doubt, as magnificent and historical as it was meant to be! You automatically become quiet and humble when going in. Antwerp is known as the city of books and the Nottebohm room is stunningly beautiful with its curved and chirping parquet, two floors finished with curly fence and giant leather-bound books. If you would put all the books next to each other, you would be 35 kilometers from home. The doors only open for exhibitions, lectures, concerts or guided tours; check the calendar to see if you can visit this beautiful gem. Perfect for a rainy day and when there is an exhibition, it is open on Sunday!